Earlier this year INFOCUS, the Photography Support Organization of Phoenix Art Museum, called photographers to send examples of their self-published photobooks. The purpose of the exhibition is to explore the range of ways that artists are using newly available commercial technologies in order to express themselves. A jury, made up of seven industry professionals including, Founder, Indie Photobook Library – Larissa Leclair and authors of Publish Your Photography Book Mary Virginia Swanson and Darius Himes, reviewed 271 submissions from 15 countries in the Americas, Europe, Asia and Australia. 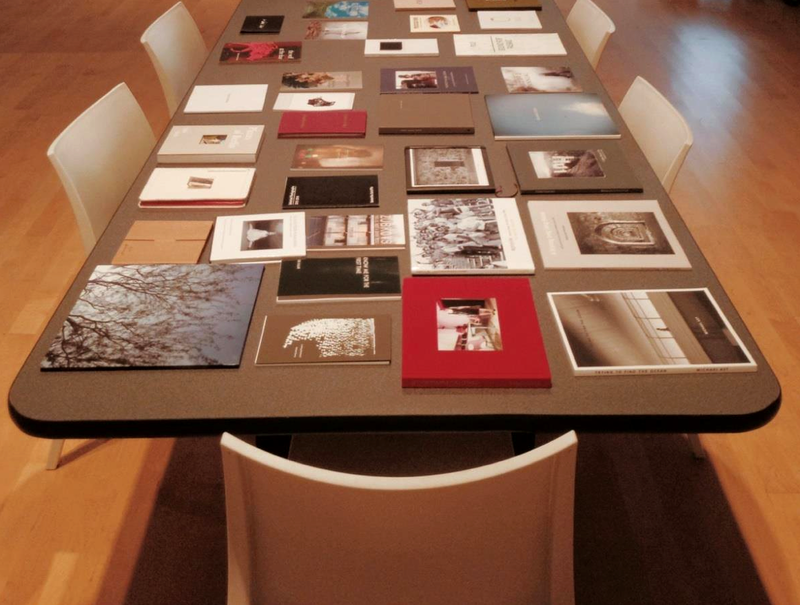 The exhibition represents the 151 books they chose, as examples of the wide range of photobooks being produced today. We asked for books of any subject including retrospective, project-based, souvenir albums, fictional narrative, exhibition catalogues, poetic, biographical, or children’s books, and welcomed collaborative or collective books in addition to those by a single author. We found that in a well-crafted book, the artist considers every element of the book’s design, and uses each to enhance the finished product. Among the selections are noteworthy selection of paper weight and surface; cover material; printing method and reproduction quality; font style, color and size; text placement and justification (centered, aligned to the right or left); endpaper and title page design; binding (spiral bound, hard bound, paperback); size and placement of the images; sequence of the images; and inclusion (or exclusion) of and placement of the caption information. From the earliest years of the medium’s history, photographers have embraced the book form as a way to present, organize and disseminate their work. Books allow photographers to expand their reach to a much larger audience and to control the presentation of their work. Publishing a body of work also increases prestige and permanence; by creating books, artists know that their printed volume, in libraries and private collections, will long outlive them. Within the art field, there exists a reverence for books, a reverence that acknowledges the care and attention that went in to producing them. Publishing photographic books has rapidly changed over the last twenty years, with the impact of technology on book publishing and photography. Costs of paper, printing and binding have increased and profit margins for traditional publishers are narrowing, creating a risk-averse climate in which unknown artists have difficulty getting books published by existing presses. The bookstores where we once browsed and purchased books are being replaced by online retailers, which in turn, changes our patterns of buying and the way products are marketed. Furthermore, many types of reading (including news, correspondence, and recreational fiction) have moved away from sheets of paper and bound books to digital displays of various kinds. Despite these massive shifts in how they are made, the desire to produce photographic books is only increasing. Young photographers want their artwork to be presented as a book, and photographic books continue to be produced, discussed, admired, coveted, collected, and sold. “The Process and the Page: Developing Photographic Books,” on view at Phoenix Art Museum from March 29 to August 17, 2014, presented book-making materials from the archival collections of the Center for Creative Photography, to show how photographers have participated in the creation of their photographic books over the course of the last 100 years. Now, with the INFOCUS Juried Exhibition of Self-Published Photobooks, we can shed light on an important new phase in the story of photographic books – the ability of photographers world-wide to produce high-quality books of their work through self-publishing. My book deals with the political scene and is a parody of the potential for government agencies and politicians to do absurd things for, as they call it, ‘the good of the people’. SEE THE BLURB PREVIEW HERE: Doug’s Book.